Includes one hanging reaper with color changing skull face. Decoration measures 35.5" tall and 33" wide. The reaper features a skull face that has color changing lights for the eyes, nose, and mouth. The body of the reaper is made from tattered black fabric draped in gray gauze. 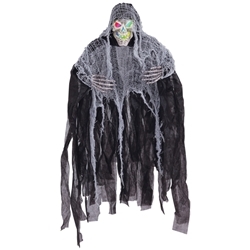 This color changing reaper will give your haunted house or Halloween decorations a unique eye catching look. Requires 3 "LR44" watch batteries. Batteries are included.